Retail customers considering the purchase of a new travel trailer or fifth wheel should take a moment to visit the Brochure Download page on the Gulf Stream Coach web site, where they are able to download full-size, full-color versions of the latest Gulf Stream Coach product brochures. The brochure include exterior and interior photographs, pictures of popular features and options, extensive lists of Standard Features, Options and Packages, complete floor plans and height, weight and capacity information. The brochures are an excellent starting point in the process of identifying what Gulf Stream brand and model will fit a customer’s expectations. The next step is a visit to a nearby Gulf Stream Coach Dealer to step inside an actual example of Gulf Stream quality, experience and innovation. This entry was posted in News on March 11, 2014 by digitalhill. The Price! 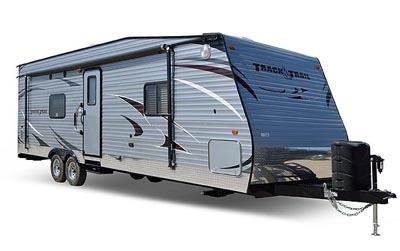 – With prices almost any active outdoor family can afford, Track & Trail toy haulers are the affordable dream-come-true. Most recent buyers of Track and Trail units didn’t even think they were in the toy hauler market, because of the sky-high prices they have seen on so many other brands. Ease of Towing – With dry weights form 3,800 to 6,000 lbs., Track & Trail units can be towed behind 1/2 ton pickups and many other towing-equipped family vehicles. No need for a heavy-duty diesel stump-puller, so buyers save tens of thousands on tow vehicles, and have less stressful time on the road. 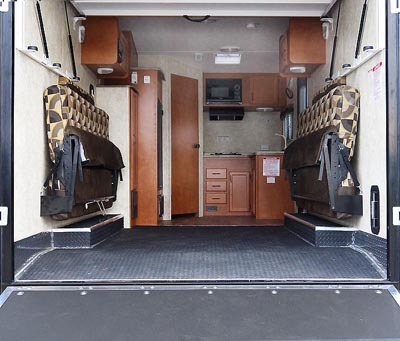 Room for All Kinds of Files – Many buyers know they might never roll a dirt bike up the ramp, planning instead to use the huge, rugged Track & Trail garage to move their kayaks, gas grills, water toys, lounge chairs, and other bulky gear to their favorite campground, for a summer full of family fun. 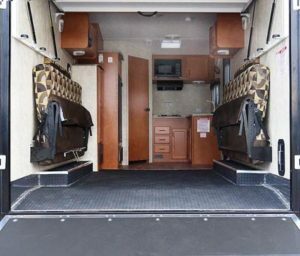 Multi-Purpose Cargo Space – It’s ideal for go-karting, flea-marketing, dog-showing, gold-prospecting, and virtually every other outdoor activity that combines outdoor gear and overnight accommodations. Rock-Solid Design Features – An 8 ft. ramp with 3,000 lb. capacity and a full-width spring-assisted hinge; a powder-coated steel generator tray, diamond-pattern rubber garage floor, fold-up sofas, a folding portable picnic table, and all the comfort and comfort and convenience any outdoor enthusiast could want. For complete information on the Track & Trail line of toy haulers, contact your Gulf Stream Coach Dealer or visit the Gulf Stream Coach Web Site. This entry was posted in News and tagged Gulfstream RV, RVs, Travel Trailers on March 11, 2014 by digitalhill.